DIN [A] Tod do not intend to make it easy for potential listeners … their cryptic band name and symbolism are complicating an easy categorization of the Berlin-based trio. DIN [A] Tod want to confuse, stir up and induce emotions. “Symbols are nothing else than concentrated images”, states singer Sven. “All our thoughts are driven by images. The power inherent in these symbols is similar to the one emanating from music: it can invigorate, fascinate and cause upheaval. This is what DIN [A] Tod is all about.” The name also fits hand in glove. It is a sort of fusion of system and void. In case you are now expecting pathetic laments on the condition of the world or a headstrong artsy-fartsy bilge, you can lean back and relax because DIN [A] Tod are none of the above. On their first long player “The Sound of Crash”, they gift-wrap their reflections on power and hysteria, the world, the universe and the bloody rest into groovy beats, versatile song structures, somewhere between Minimal Electro, Wave and Electro Clash … and catchy tunes that have been stripped down to the bare essentials. Sven and Claudia formed DIN [A] Tod in 2003, bored by vands that follow the usual line up of “guitar/bass/drums.” They purchased a solid base of analogue synthesizers, drum sequencers and recording equipment … and went to work. Musically, they started out by merging the sound of the early Eighties – from Joy Division to the early Sisters of Mercy – with minimalist electronics to create a musical mixture that is just as intriguing as it is catchy. They recorded the first demo in 2004 and started playing concerts. In 2005, the signed to Out of Line Music and released their debut single – fittingly enough on 10” picture vinyl. They then deliberately took their time for recording the album „The Sound of Crash“, due for release in late autumn 2007, in order to avoid stylistic repetition and stagnation: the worst enemies of any artist. Phelix, of the group Mercydesign, was integrated as a third band member and DIN [A] Tod started working on the new tracks in Frankfurt and Berlin. Each band member was given total creative freedom and the group experimented a lot with sounds and song structures in order to create a highly versatile album. Claudia also contributed vocals to “The Sound of Crash” and guitars were added to the song arrangements. From catchy Electro Clash tunes like “Carol's Fascination” to complex tracks like “Ephedrine Logic” (a song that the band has been working on for more than a year), the first full album of DIN [A] Tod is a mesmerizing experience that sports a lot of zest and energy. In November 2007, the group heads out on the Out of Line Festival Tour to prove that they can also unleash their unique energy in a live situation. 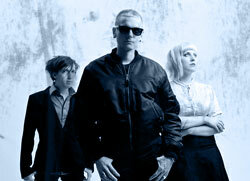 In February 2009, DIN [A] Tod released their second album, "Westwerk", on which they cunningly refined their unique combination of Post Punk and Electroclash. The ambitious mix of minimal Electro sounds with meandering guitar- and bass-lines mingled with a distinct coolness sounds even more compact and mature than the group’s critically-acclaimed first outing.